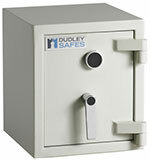 Harlech offers good level of protection, a popular security feature is the safes weight. 50mm fire resistant barrier protection body. Steel plate door including heat-activated door seal providing additional level of fire resistance. Two - way moving bolt work, protected by A.E.D device. The body is constructed with 50mm fire resistant barrier protection body. Steel plate door including heat-activated door seal providing additional level of fire resistance. The door is locked using a high security keylock.